Welcome to the June edition of the FoMM newsletter. Hope you have all been enjoying the clear and crisp winter weather lately to get out and about on Mt Majura. 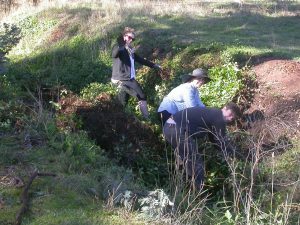 We had a fantastic work party last month removing around four cubic meters of Japanese honeysuckle and some English Ivy from the bottom part of the drain line off the lower Hackett reservoir. Participants even spotted a fox and a frog! Read more below. Many woodland birds have also recently been seen at The Fair including Golden whistlers, Scarlet robins, Speckled warblers and more. We highly recommend a ramble here but don’t forget to take your binoculars! 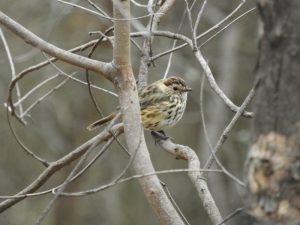 And if you get a good bird photo, please register it on Canberra Nature Map. Give a hand and help transform Mount Majura’s weedy woodland east of The Fair into native wildlife habitat, enjoy the little woodland birds foraging amongst the planted trees and shrubs and learn about the work of volunteers to reclaim grassy woodland in the area. 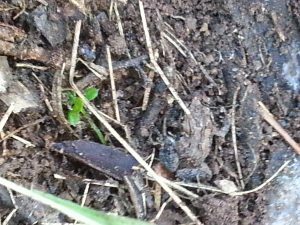 Help with spreading wood chip mulch (this reduces erosion and works as a soil conditioner that helps native plants to establish), direct seeding Kangaroo grass and installing protective wire mesh guards around existing plants. Much of the native ground layer has been lost and replaced by herbaceous weeds as a result of overgrazing and other degrading activities. The reintroduction of native grasses and local wildflowers complements weed control, increases plant diversity, reduces erosion and provides habitat for local invertebrates, lizards and birds. Give as much of your time as you want; please come early for an introduction if you can. Where: Meet at the Nature park entrance Tay / Ian Nicol Streets, The Fair, North Watson. Bring: Sun protection, sturdy shoes and appropriate clothes; tools and afternoon tea will be provided. 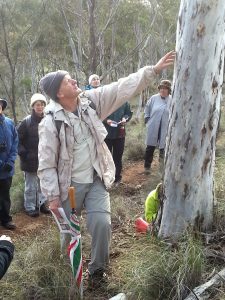 Join ecologist Michael Doherty for an information-packed walk on the slopes of Mount Majura and Mount Ainslie. Learn how to identify local woodland trees, see where they occur and hear how they survive fire and drought. Tree guides will be available at the walk. Gold coin donations are welcome to support FoMM’s conservation work. No booking required. Read about The Eucalypts and Wattles (Michael Doherty, August 2012). View some features of eucalypts and other trees in this Picture Gallery. Where: Mt Majura and Mt Ainslie nature reserves; meet at the Kellaway Street entrance near the end of Phillip Avenue. Bring: Sun protection and wear sturdy foot wear and appropriate clothes for the weather. Join FoMM to celebrate National Tree Day 2017 and help with the planting of local trees, shrubs and flowering ground-cover plants! This will be our 5th National Tree Day community planting in the nature park at “The Fair” and the 10th consecutive mass planting in the Mt Majura nature reserve on a National Tree Day. The planting holes will be dug prior to the event and water delivered so all we need are volunteers to help with planting, watering and mulching the seedlings. Volunteer registration opens at 12.45pm. Please come early for a demonstration on “How to plant”. What we will plant: List of species with photos. 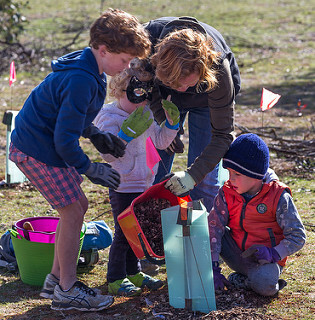 The Majura Mountain scouts and parents will again be on board to extend their planting from last year on National Tree Day. We still need a few more volunteers to help out on the day as ‘planting buddies’, to welcome and direct volunteers, ensure sign on sheets are completed, or help out on the Sunday morning or Saturday beforehand. Where: Mount Majura nature reserve behind (east of) The Fair in North Watson. Access park entrance at the intersection Tay St and Ian Nicol St close to the volunteer registration point or via nature park entrance Antill St roughly opposite Carotel for a 5-10 minutes walk to the planting site. Car parking: along Antill Street opposite the nature park entrance; limited car parking space at The Fair and along Aspinall Street / Solstice. What to wear: Garden gloves, appropriate clothing and foot wear, wrap up warmly. What to bring: Bucket, trowel or small mattock if you have one. Important: please label your items with your phone number so that we can reunite any left-behinds with the owner. A big thank you to the Molonglo Catchment Group and EnviroAg for providing funds from the 2017 Small Grants Program for FoMM to purchase tube stock (from Greening Australia) and equipment for this planting event! Honeysuckle goes at the May work party! On a perfect Canberra late autumn day, 10 volunteers helped remove four cubic meters of Japanese Honeysuckle from the lower part of the drainage gully close to the lower Hackett reservoir. A big Thank You to Grace, Lani, Sam, Felicity, Chris, Tanja, Margy, Max and Jochen for this wonderful and very satisfying massacre. It was particularly encouraging to have so many engaged young people and Margy’s delicious cake was a truly earned treat for everyone. Participants were startled by a fox hiding in the thickets! All weeds were pulled rather than cut and sprayed with herbicide. The drain line is known habitat for long necked turtles and frogs, and participants of the work party were delighted to spot a little frog of which Max took this photo! All Hackett residents can help by refraining from dumping garden waste in the reserve. Grace, Lani and Sam having fun removing Honeysuckle at the May FoMM Working Party. (Photo: Waltraud Pix). In the April edition of the FoMM newsletter, we announced a survey for voting for your preferred location of a new commemorative park bench on Mt Majura as part of the 30th ParkCare anniversary celebration. The results are in – the favoured location from the five suggested locations for the new Mount Majura ParkCare bench, at 41.7%, is the old sheep camp at the bottom of the summit trail, on the saddle along the Casuarina Trail. Thanks to everyone who voted and to Aaron for conducting the survey. The new bench will be installed very soon! Did you know that 69% of Australians are on social media, and that the average user spends 12.5 hours a week on Facebook? Volunteer groups are starting to get in on the action and it’s a useful way of recruiting new members, promoting your events, retaining younger volunteers and to help the broader community understand what you’re doing and why you’re doing it. Come along and learn how it all works, how to post text, photos and events, how to tag and interact with other pages and how to work collaboratively with other volunteer groups by using tagging, hashtags and sharing. Come and listen to Brett Howland- research and monitoring officer as he shares the latest information on kangaroos, biodiversity and grassland habitats. RSVP to either of these forums by sending an email to Alison McLeod (Community Programs Coordinator) with your name and any questions you’d like answered. Sally Blake’s solo exhibition at the Australian National Botanical Gardens Gallery, The Colour of Eucalyptus will feature textile, basket and paper-based works that have arisen from her eucalyptus dye research undertaken at the Gardens. Trained in the textiles workshop at the ANU, Blake uses her sensitivity with materials to create artworks that explore these dyes on a range of natural fibres and threads. During the project she recorded the colours from the leaves of 230 and the bark from 100 eucalypt species. The leaves which create these wonderful dyes are also highlighted in pressed leaf arrangements on paper. Small baskets, Hidden Mysteries have been made using a range of threads, each woven from the colours of one eucalypt species. Blake is also exhibiting her Eucalyptus Mantle works. She came to think of eucalypts as a mantle cloaking the country, their roots holding the soils and their leaves and branches providing habitat and shade. The Mantle works are made from the thousands of colours created on linen, wool and silk dyed during the project. The pattern references weave structures that might be used for a cloth mantle. Sally Blake will run 3 eucalyptus dye workshops in conjunction with the exhibition at the ANBG on the 7, 11 and 18 June. Community symposium discussing research, strategies and expectations for fire management in the ACT in a changing environment, with the National Parks Association ACT, Conservation Council ACT Region, Parks and Conservation Service and Emergency Services Agency. You can obtain more information here or just go straight to bookings which are available now. Many interested people from all over Australia are converging on Broken Hill in early Spring to celebrate the 80th anniversary of one of the world’s earliest restoration projects: the Broken Hill Regeneration Reserves. This will mark the inauguration of the Albert Morris Ecological Restoration Award hosted by the Australian Association of Bush Regenerators, Australian Network for Plant Conservation, Greening Australia and the Society for Ecological Restoration Australasia. Read more here, watch this video about the upcoming event and read the special Broken Hill issue of AABR News.